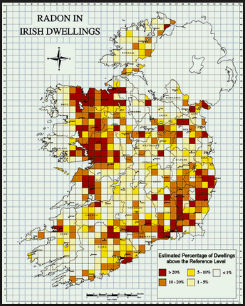 In the map on the right the areas are shown of the locations of risk in Ireland. This is not to say a location may not be affected. The findings are a guide and every specific location of a property has its own risk depending on protection against this poisonous gas. Currently the test carried out in Ireland is by placing two capsules in your property for a 3 month period. Then you send them off to get tested in a lab. This test has an estimate error of 26%, assuming this is for various reasons. These maybe due to the sample being transported in a non protected and sealed container. Also, the sample being tested has to take the duration of the placement of the capsules into account and this may be another factor. ECAS test the property on-site and do this in 1 week, analysing the actual atmosphere in the dwelling and obtaining a result straight after the test is completed. As an independent company our only concern is of our clients we are undertaking the test. If our clients require further advice or consultation works to be carried out this can be arranged thereafter.